Outdoor deep fryers have been very popular in the Southern part of the USA for years. They’re increasingly becoming more popular in other parts of America and around the world as well. Traditionally, people have deep fried turkey in outdoor deep fryers but there are ton of other uses for them as well. You can deep fry other meats, fish and poultry, vegetables, make big batches of stew or soup and home brewers love these big outdoor cooking kits as well. This heavy-duty outdoor deep fryer kit from Chard is one of the cheaper, all-in-one kits out there (along with Kamp Kitchen). For a reasonable price, you get everything you need for deep frying turkey, or other meats, fish or poultry. It comes with a pot, stand, and burner. All you need is a propane bottle. Turkeys are big and take up a ton of space in the oven for a lot of hours. Deep frying turkey frees up this space and allows you to cook casseroles, desserts, fresh bread, etc. Deep fried turkey is delicious! Really, really delicious. Try it out and you’ll see for yourself. Keep the heat out of the house. If you live in a warmer climate, it’s not ideal to have the oven on for so many hours to cook a turkey. Keep the heat outside with an outdoor deep fryer. The novelty of it! Your friends and family members will be very impressed. If you’re looking for a cheap outdoor deep fryer to use only once or twice, consider this one from Chard. It’s extremely reasonably priced at under $100, but we have a lot of reservations about the quality of it. While it will deep fry a delicious turkey, it doesn’t seem that durable. Another thing we don’t like about this outdoor deep fryer from Chard is the lack of details in the product description on Amazon. What is the pot made from? How big is the pot and what size of turkey can it fry? Does it come with a basket, hook, thermometer, etc.? Is there an auto shut-off valve? There simply isn’t enough information to help you make an informed decision about whether or not this is the outdoor turkey frying kit for you! For our money, we’d give this Chard Heavy Duty 50,000 BTU Outdoor Propane 30 Quart Deep Turkey Fryer with Pot a miss. Some of the better options include the following. Eastman Outdoors Stainless Steel Cooking Set– This is a heavy duty outdoor frying kit that will last you for years. The pot is made from stainless steel, which is a big step up from the aluminum pots that come with the cheap outdoor frying kits like this one from Chard. This kit has great reviews on Amazon and it will last you for years. Money well spent! 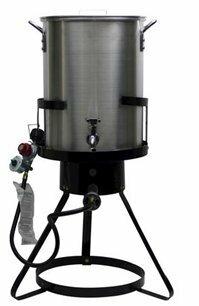 Grand Gobbler Turkey Frying Kit– Bayou Classic is one of the most trusted names in outdoor deep frying and this kit from them is a beast of an outdoor deep fryer. It’s designed for birds of 25+ pounds. It’s a serious machine for a serious feast!